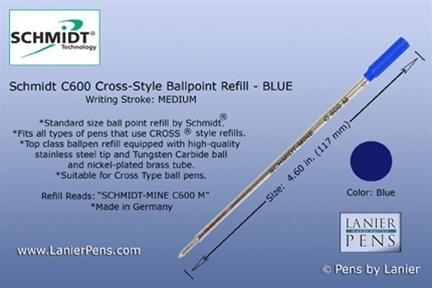 Schmidt C600 Cross Style Medium Tip Ballpoint Refill. High Quality Stainless Stell tip and Tungsten Carbide-Ball. 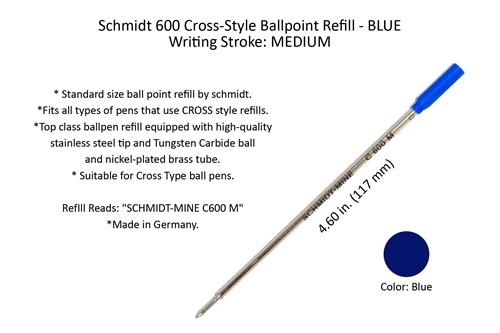 Standard size ball point refill by Schmidt. 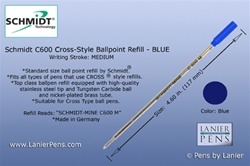 Fits all types of pens that use Cross ® style refills. Refill Reads: “SCHMIDT-MINE C 600”. Suitable for Cross Type ball pens.